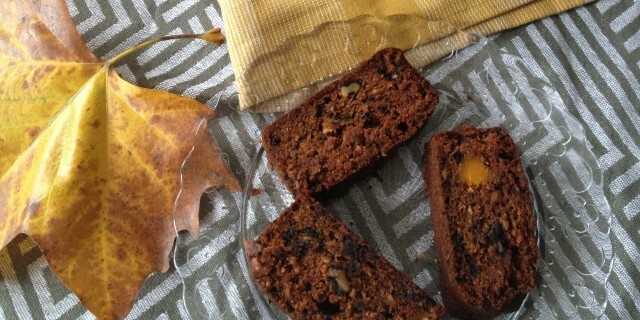 This Pumpkin Walnut Bread is absolutely to die for and gluten-free and dairy-free. This week I have been experimenting with different kinds of pumpkins in my kitchen, and, yes, I have been going a bit crazy. I love pumpkins in fall. They are naturally sweet and warming. I made a huge batch of pumpkin puree this week to make my own Pumpkin Chai Lattes. I made way more then I possible needed for my lattes, so I had to find a new home for my big bowl of sweet pumpkin puree. Pumpkin Chai Lattes are great with something baked so I decided to switch up my recipe for walnut banana bread and made Pumpkin Walnut Bread instead. We have been eating it for breakfast or as a sweet treat with our cup of tea. It’s also great with my Pumpkin Chai Latte. In this recipe you can also use pumpkin puree from a can but I prefer fresh pumpkin. You can easily make your own puree. You will need a sweet pumpkin. For example, sugar pumpkin or hoikado. Cut your pumpkin in half, remove seeds and wrap the pumpkin halves in alu foil. Place the pumpkins halves (open side up) on a non-grease baking tray in a preheated over at 165 degrees Celsius for one hour. When soft and tender, scoop out the pumpkin flesh and puree it in a blender, until you have a smooth consistency. In a medium-sized bowl, whisk the buckwheat flour, spices, baking soda, sea salt and vanilla into a fine flour. Stir in the pumpkin puree, melted coconut oil, maple syrup, vanilla and water until you have a smooth, silky batter. Then add in the chopped walnuts and mix them gently into the batter. Add apple cider vinegar and mix into the batter. The vinegar will help the pumpkin bread rise as it reacts with the baking soda. When ready, set aside to cool down. When it’s completely cool, you can cut the bread in slices and serve them up. I like to sprinkle some cinnamon on top. Serve with Chai tea or Pumpkin Chai Latte.